Normally, in iOS, we used to press the Apps Icons from Springboards to enter in the wiggling mode, and then we can change their location, and page on our iPhone and iPad, but what about changing the location of the app icons without entering the device springboard in wiggling mode? Undoubtedly, the idea is pretty cool, but have few bad sides too, as it loses the grip of content on the screen, and allows users to easily change the location of app icons by simply dragging them on-screen, but as we all know, every story has three sides, so there will be few people who like to place their icons on the screen with a single gesture, and have been waiting for so long to get the feature on their iPhone and iPad devices by Apple. However, Apple has yet to provide such kind of feature on iOS for iPhone, and iPad devices, but the popular jailbreaking community definitely got their hands on some new kind of tweak that allow users to easily play with the springboard icons with a single gesture. If you don’t know, let me tell you we already have something similar to this function from jailbreaking community for the iOS devices, but a little different from this tweak. There was already a tweak launched in the community that allows users to simply close the application from app-switcher by skipping the wiggling mode on iOS. So, similar to that tweak, there is another tweak in Cydia with name of “AlwaysArrange”, which allow you to easily arrange your application icons on your device screens. AlwaysArrange is a straight-forward tweak that comes with a simple and very easy options tab in the Settings panel of iOS devices, through which it allows the users to configure its functionality according to the needs. You can select the duration of the process, or can set up it to zero to perform cool and simple gesture arranging on your springboard icons. AlwaysArrange is yet to launch in the public beta repo, but reportedly, it will soon make a way to the public beta repositories. 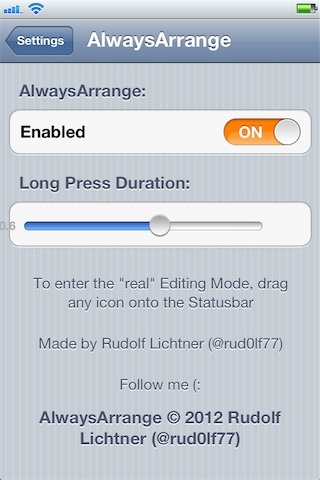 According to the developer behind the tweak, the tweak will launch in ModMyi repository, so stay tuned with us.